Let's face it: Annual reports can be as graphically dull as a dusty board - Institutional photos, impersonal data, and CPA-friendly data tables that blind readers with reams of small-type numbers. 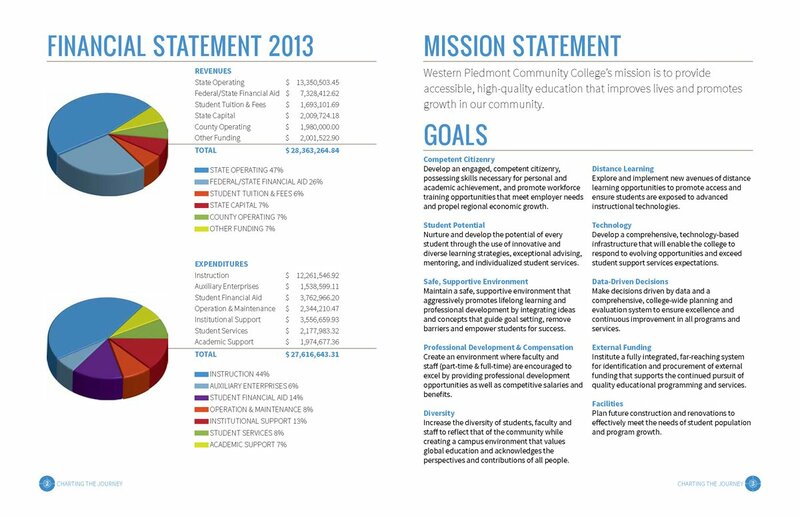 So when Western Piedmont Community College engaged VanNoppen Marketing to renovate its Annual Report we leaped at the opportunity. While complying to WPCC's graphic standards, we retooled the layout design and ensured, most importantly, that the visual focus celebrated the ultimate goal for students: Graduation. And using WPCC students in authentic graduation celebration images. VanNoppen Marketing redesigned the college's Foundation collateral to reflect the same graphic vision and integrity as the annual report. 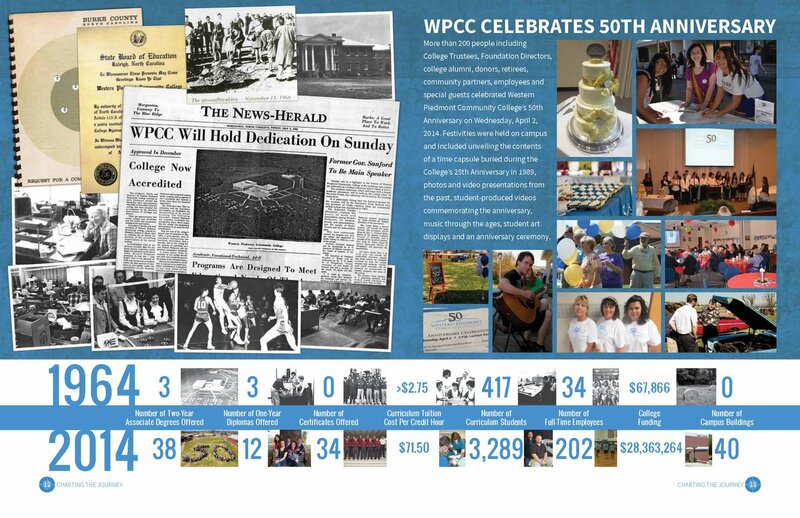 First and foremost, VanNoppen Marketing replaced the "personal challenge" images with those of WPCC students celebrating graduation. WPCC's annual report is loaded with extensive information that details enrollment, financials, trends, and staff and student accomplishments. An easy-to-read Table of Contents is essential. Areas of most interest to WPCC Annual Report readers are: where is the money coming from and where is it going? A complex question. VanNoppen Marketing simplified with accuracy these two sides of the balance sheets in data-rich graphics. 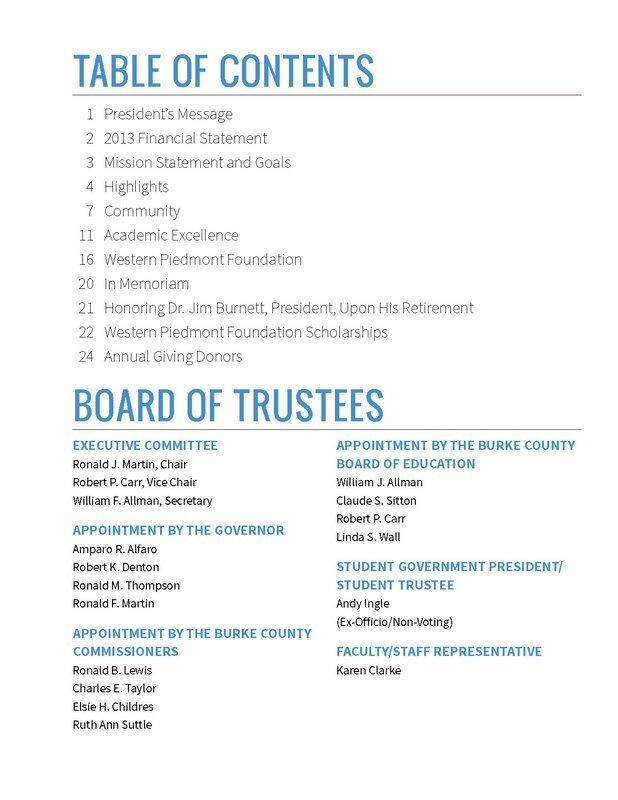 Western Piedmont Community College's history and commitment to the community, and the community's commitment to the college is undeniable. VanNoppen Marketing developed a compelling timeline, spread across a two-page spread, that documented this rich relationship. Thanks to the many local contributors of historical photos, articles and documents for this important page.